A-LINX Building Technologies – Revolutionary. To the core. Prefabricated light-gauge steel structures that deliver a heavy-duty competitive edge. A-LINX is a fully integrated general-contract-service provider that pre-builds exterior/interior load-bearing wall systems and roof trusses. Our systems allow you to complete your superstructure in an expedited timeframe, reducing the building costs associated with traditional construction. 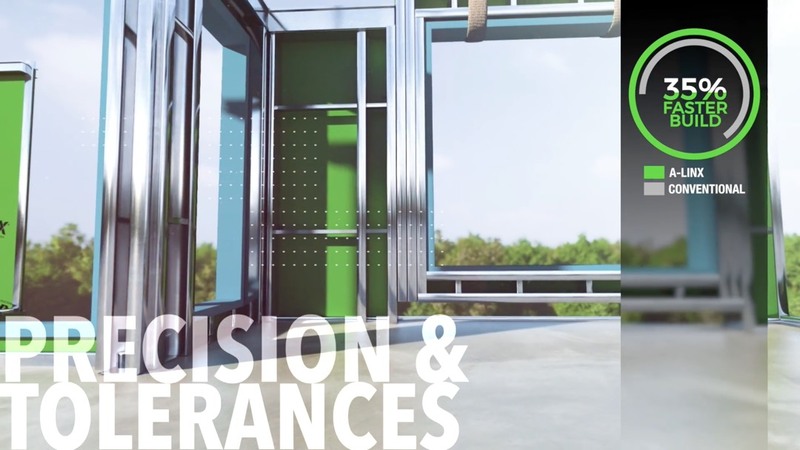 Standard or custom components, including pre-finished panels in a range of building material options, allows for design flexibility and can adapt to unique client demands. Tighter tolerances and precision assembly processes dramatically reduce site issues, allowing your project to advance with previously unthinkable speed, accuracy and economy. A-LINX offers several revolutionary advantages over conventional construction methods. Click here to learn more. Assemblies can be shipped ready to install with sheathing or with finished facade surfaces already applied. Click here to learn more. Factory assembly allows for unmatched precision, repeatability, and production efficiency. Click here to learn more. Projects that demonstrate our experience and highlight the design posibilities of Light Gauge Steel. Click here to learn more. Less time, less material, less manpower on site: it all adds up to significant cost reductions. Click here to learn more. Together with an affiliated construction contractor, A-LINX pre-fabricated light gauge steel construction also gives architects, engineers and developers a distinct competitive edge. A-LINX builds on the strength and experience of industry professionals who deliver decades of experience across a comprehensive range of construction disciplines. Our core team is led by experienced innovators in light gauge steel construction and certified welding professionals, and backed by on-staff construction managers who have collectively managed projects valued at over $3 billion. Our core team has managed projects collectively valued at over $3 billion.